Imagine taking two of science fiction’s best horror movies—Alien and Event Horizon¬––throwing them into a blender with Resident Evil 4, and then sprinkling in elements strongly reminiscent of Scientology. Dump that goop onto a pan, throw it in an oven, and what comes out should be Dead Space. Dead Space is one of the “new” EA’s first forays into something called the “original IP,” an experiment that has brought them new life with games like Mirror’s Edge, Spore and Skate. These are unlicensed games, unestablished properties, and they are not necessarily going to bring in as much revenue as, say, a Madden or Call of Duty title would. In this instance, the experiment is largely successful: Dead Space is a game that, while never exactly adventurous with its game play elements, does what it sets out to do very well. Everything here is borrowed from another game. The camera and game play, from Resident Evil 4; the way that the story and environment mesh, including presentation of certain story elements, from Bioshock; these and many more influences litter the halls of the USG Ishimura, a place dense and claustrophobic with the newly dead and newly reanimated. You control Isaac Clarke, an engineer who, along with the crew of a repair ship, has been dispatched to help the crippled vessel called the USG Ishimura. Clarke has a personal stake in the mission, however; a woman named Nicole Brennan, Isaac’s ex-girlfriend, is a doctor stationed aboard the ship. Upon docking with the ship, it soon becomes pretty apparent that there’s something very, very wrong with the Ishimura, and that maybe repairs aren’t going to cut it. The crew is missing. The halls are darkened and the walls splattered with blood. And there are… things roaming the halls, things that don’t seem to die. It is through this that Isaac, and consequently the player, must traverse to figure out what went wrong, to save the repair ship crew, to save Nicole. Things aren’t going to be easy on that front. 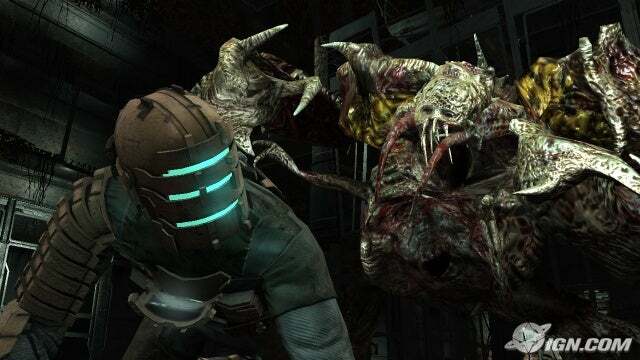 Dead Space introduces an element to the horror genre that challenges the player to pick their shots, and pick wisely. Enemies don’t go down by headshots, and they don’t go down from hits to the body, at least not very easily. Instead, the developers force the player to aim at the extremities: it slows down the target, and, for some reason, enables the player to kill the enemy (called Necromorphs) far faster than if the player shot at the head or the body. This slows down the pace of a game that could have been a sci-fi reimagining of RE4, and also makes the game much gorier. It also encourages ammo conservation, since, like many horror games, ammunition becomes more difficult to come by in the later stages of the game. Dead Space has twelve missions in it, generally lasting an hour each (less, if you don’t take your time). Each of these missions tends to have a very simple structure—the player receives orders, tries to fulfill orders, has to clear out a ton of enemies, maybe has to solve a puzzle, and then returns to mission start. A tram that transports the player around the ship connects all missions, and through this most areas are revisited once or twice, though never for reasons that aren’t logical. The developers wisely chose to have you revisit an area if a logical item was there. If you have to search a dead body, check the morgue; if you have to reactivate the engines, you go to the engine room, etc. Nothing is out of place, and progression always makes sense. Game play variety is where Dead Space falters. Most of the time, the game has you running from point A to pick up an item at point B, with a couple of monster closets and rooms to best along the way. This isn’t exactly boring, because Dead Space manages to be consistently entertaining throughout the length of its ten or so hours, but it isn’t exactly variety, either. Where that comes in is in two areas: zero gravity and zero oxygen sections. Since you’re making your way through what is essentially a crippled freighter floating dead in space, you’re bound to run into areas on the ship where external repairs have to be made or internal malfunction has caused some sort of gravity or oxygen deficiency. These sections of Dead Space add some more flavor to the mix, and tend to be executed quite well, with the exception of one ridiculously unnecessary asteroid shooting segment, a set piece that has controls so terrible, they reminded me of the worst parts of N64 game Shadows of the Empire (referring only to the N64 version; I’m unfamiliar with the PC game). That is to say, they’re loose and unresponsive, spurring multiple attempts to complete the segment should the player be compelled to do so. Graphically, Dead Space is gorgeous; the Ishimura, where most of the game takes place, is a varied environment, not all gray corridors and atmospheric lighting. No one area on the ship looks the same, which is great for the progression in the game. Texture work on both character models and environments is right up there with the best of them, lighting is phenomenally impressive and animation is the same. All of it lends credence to the idea that you, as Isaac, are really on the ship, and really experiencing the horrors that might be lurking behind every door, around every curve. Any printed text in-game tends to be too small on an SDTV; I got a headache a few times after playing too long, which is a problem. Side story bits, inventory and the on-screen map are handled through a pop up menu, since the game does not actively pause (except when you press the “Start” button) for pretty much anything. All of this adds to the progression of the game, but is essentially optional, and not required to complete the game. Upgrades for weapons, new weapons and suit upgrades are all handled like this, too, except through collection of valuable items as the player travels the ship; upgrades are handled through a workbench feature, which is much like leveling up, RPG-lite style, while new purchases and suit changes are handled through a store that you can access (generally) around tram stations. The RE4 influences continue. The audio is, likewise, amazing. From sound effects to voice acting, everything rings true to the genre and never comes off as cheesy or misplaced. All of the music in game adds tension and contributes to the ominous atmosphere that the developers were going for. Add in the excellent use of surround sound, and at times, it really does feel like you’re surrounded by the enemies that populate the ship, fighting for your life. Gore is prevalent in Dead Space. The entire combat system is based around the player strategically dismembering enemies. Blood often splatters the walls and floor, and, sometimes, Isaac’s body. There’s also a ton of frightening images strewn throughout the game, from imposing boss enemies (three of them, I think) to standard, disturbing horror fare (bodies being autopsied, an apparent suicide, etc.) meant to unnerve the player. Profanity doesn’t tend to be a problem, which means that it’s not featured throughout the game, though there are some instances of curse words, one or two of which is the f-word. A major facet of the story deals with a cult-like religion; some of the religious concepts that the followers of that believe in are detailed for the player, though there’s not much exposition on that front. Dead Space is easily one of the best games that I’ve played in the last year. It’s not perfect, and it’s certainly not original, but it’s a great example of what happens when a good idea meets strong execution, coupled with a compelling story and universe. However, while Dead Space is certainly well done, it’s most definitely not frightening, and hardly creepy. The atmosphere, while well set up, isn’t exactly successful in creating an ominous tone; I can honestly say that I was only mildly creeped out once or twice during the game, and those were due to incidental happenings in the game world, only one of which I’m sure the developer had anything to do with. That said, those going in expecting an excellent story and a great game can’t go wrong here; those expecting to be scared like they were playing Silent Hill 2 should rent Dead Space first, but should expect the content to be very deserving of its M-rating.